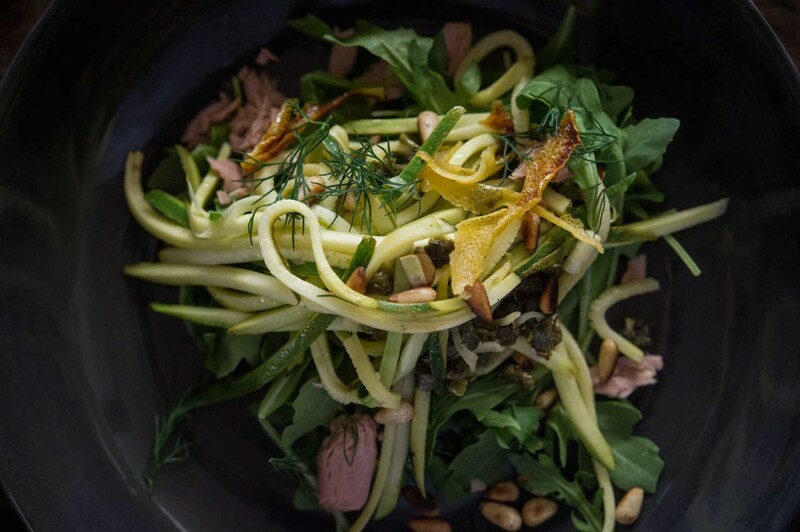 A refreshing summer salad of zucchini vegetable pasta with chilli and tuna. I found this one in the Donna Hay Power Foods mag … its delicious. Very low in calories, very high in health and goodness, and very quick and easy to make. The zucchini pasta was a revelation, and it will be a regular now in many a summer salad concoction. I crushed the urge to race out and buy the latest gadget the spiralizer …. cause you don’t need one, just use the other gadget you bought after seeing it on Master Chef that will work to turn zucchini into vegetable pasta. 6 medium (1kg) zucchini ( courgettes) thinly sliced lengthways using a julienne peeler. Heat the oil in a large frying pan over medium heat, add the garlic, capers and lemon rind and cook for 1-2 minutes or until lightly golden and crispy. Add the zucchini, lemon juice and salt. Cook for 1 minute or until heated through. Remove from heat, add the dill, rocket and tuna and toss to combine. Divide between bowls and sprinkle with salt, pepper and pine nuts to serve. Would love to try this recipe. So what’s the other gadget that you have that you saw on Master Chef?